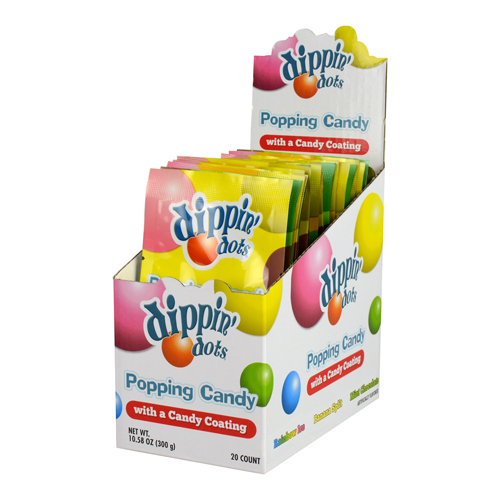 Ice cream flavors coat pieces of Dippin' Dots popping candy that will give this creamy snack a sweet kick. 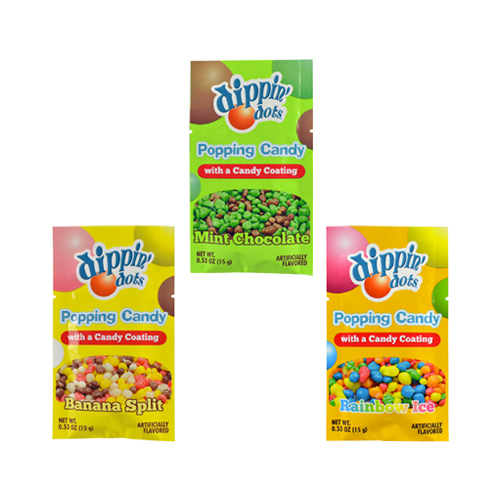 Bring home this treat in your favorite Dippin' Dots flavors: Rainbow Ice, Banana Split, and Mint Chocolate. INGREDIENTS: SUGAR, WHEY POWDER, HAZELNUT SYRUP, WHOLE MILK POWDER, VANILLIN, SOY LECITHIN, POLYGLYCEROL ESTER, HYDROGENATED VEGETABLE OIL, CORN SYRUP, LACTOSE, CARBON DIOXIDE, CARNAUBA WAX, ARTIFICIAL FLAVORS, ARTICIFIAL COLORS (RED 40, YELLOW 5, TITANIUM DIOXIDE). ALLERGENS: CONTAINS MILK, TREE NUTS, AND SOY. INGREDIENTS: SUGAR, COCOA POWDER, MILK POWDER, SOY LECITHIN, CARNAUBA WAX, HAZELNUT SYRUP, WHEY POWDER, ETHYL MALTOL, VANILLIN, HYDROGENATED VEGETABLE OIL, POLYGLYCEROL ESTER, CORN SYRUP, LACTOSE, CARBON DIOXIDE. ARTICIFIAL COLORS (BLUE 1, YELLOW 5, TITANIUM DIOXIDE).